Los Angeles (May 7, 2018) – Helinet Aviation, a full-service provider of aerial production services to the motion picture and advertising industries, announced today the acquisition of a SHOTOVER K1 camera system. Headquartered in Van Nuys, California, with an office in Atlanta, Georgia, Helinet has more than 30 years of aerial production experience shooting live events, television series and big-budget Hollywood feature films. Recent credits include Jumanji: Welcome to the Jungle, Jurassic World: Fallen Kingdom, Ant-Man and the Wasp, and Spider-Man Homecoming. Helinet will utilize the SHOTOVER K1 for assignments across the globe and have upcoming projects scheduled with Disney and Netflix. 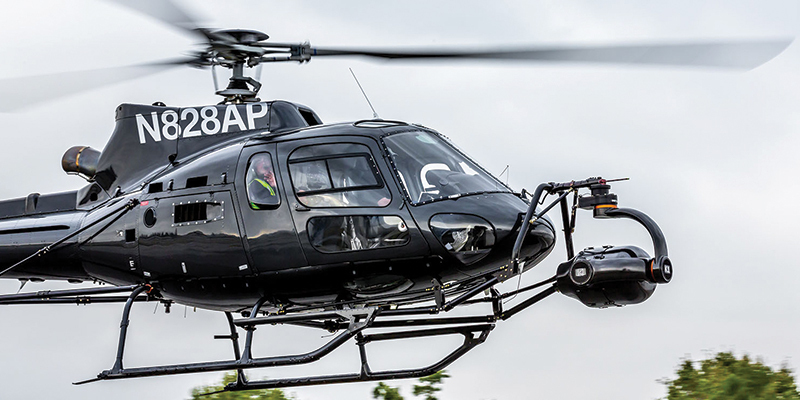 “The K1’s open platform design allows us to carry the larger payloads that productions require for feature film work while maintaining rock-solid performance under the most challenging conditions,” said aerial coordinator and Hollywood stunt pilot, Kevin LaRosa II. LaRosa leads the company’s production department as VP of Aerial Film Production. The SHOTOVER K1’s innovative 6-axis design has recently been recognized by the Academy of Motion Picture Arts and Science, awarding the creators of the system with a Scientific and Engineering Academy Award®. The Society of Camera Operators also awarded the system a Technical Lifetime Achievement Award in 2017. “Helinet is one of the leading aerial production companies in the world, having worked on some of the most iconic feature films over the past few decades,” said SHOTOVER CEO Brad Hurndell. “We are thrilled they have selected the K1 as their go-to system for motion picture work and look forward to supporting them for years to come”. In addition to the SHOTOVER K1 and F1, Helinet’s production department offers a full complement of aerial solutions for productions including a variety of single and twin-engine turbine helicopters, small to heavy lift drones, and an array of sought after camera and lens packages. MovieHawk™, the first UH-60 based in Los Angeles equipped for the motion picture and television industry, and CineJet™, a high-speed Aero L-39 Albatros jet designed for high speed aerial cinematography, are also available for production work through the company.